Kinekt Design (pronounced “Connect”) brings forward-thinking design objects and products that fuse together a modern aesthetic with tangible interaction. 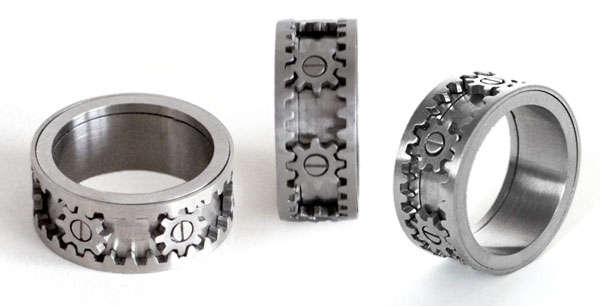 New York, New York, February 05, 2010 – Kinekt Design LLC, announced its first product launch – the Gear Ring. The ring is crafted from the highest grade alloy of jewelry stainless steel to ensure the function and precision of all the components. It embodies the company’s vision of playful yet refined design. The company has been working on developing the Gear Ring for over a year and this is their first rotating/spinning piece. A product designed for men and women, the ring is elegant yet striking, with comfort styling and smooth movement at a great price of $165. The price includes FREE world wide shipping comes with a LIFETIME WARRANTY and can be purchased online. 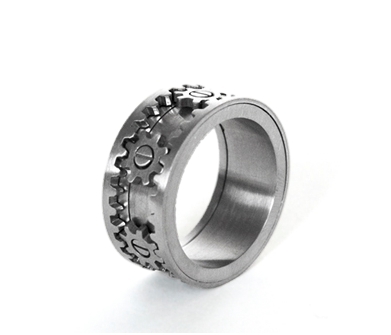 A video can be seen below or on the company website (www.kinektdesign.com) which shows how the Gear Ring works. Question: How did the three of you start working together? Answer: Well, Glen and Rachel started working together first. Rachel and Glen have launched projects/products together as well working independently. When Rachel met Andy and learned he had a strong business and finance background as well as an entrepreneurial passion it made more and more sense for all three of us to start working together. Our first business together is Kinekt Design LLC.